Lego bricks – all sorted with Box4Blox! It’s insanely simple – a box made up of four layered sieves that sorts your Lego pieces with a quick shake. Box4Blox is the Lego organiser parents have been dreaming of. A couple of times a year I sort out the kids’ Lego – it is almost therapeutic sorting bricks into compartments by colour and size. However, a few big constructions later and all the pieces are mixed up again and the kids are spending an inordinate amount of time sifting through the bricks until they find what they need. The Box4Blox holds approximately 1500-1800 Lego pieces and sorts them by size. Unstack the trays and you’re ready to start building. Simply stack the trays when it’s pack up time. 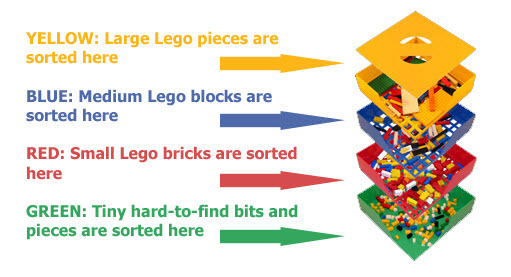 Here’s the best bit – next time you step on a piece of Lego (happens at least ten times a day in my house…), simply slot it in the top of the Box4Blox – sorted! The Box4Blox is US$74 which includes delivery to Australia.